Former Spanish capital Toledo was famously once home to three diverse and thriving cultures: the Catholics, the Muslims and the Jews. And there’s no better place to discover the rich history of the latter – the Jews – than by visiting the city’s El Tránsito Synagogue. It was constructed in the 14th century, and is now home to the Museo Sefardí (the Sephardic Museum) featuring Jewish art, objects and history. The synagogue was founded and financed by Sameul ha-Leví, after whom it was originally named. Following the expulsion of the Jews, however, it eventually served other purposes, such as a military barracks, and as an church called Nuestra Señora del Tránsito, hence the synagogue’s current name. 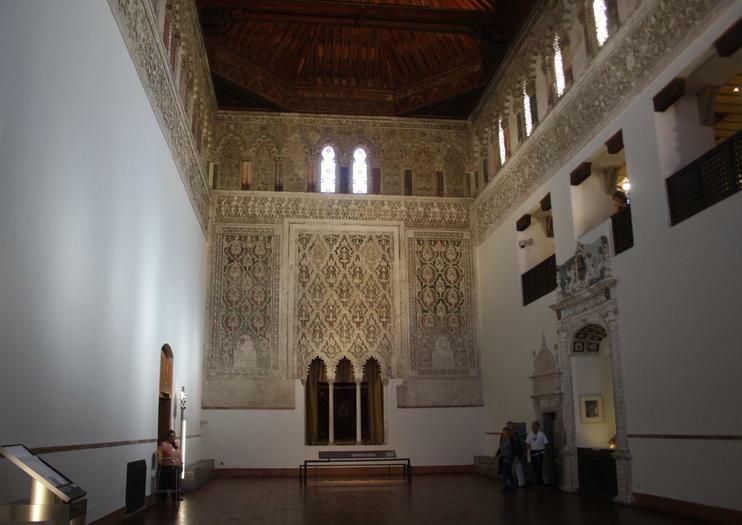 What you’ll find here today is a splendid, albeit small example of Mudéjar-style architecture, and, beyond that, an educational and meaningful link to the city’s Jewish past. The exhibits’ informational boards are only available in Spanish, so English speakers will get more out of the experience by opting for the audio tour. Note that the synagogue is closed on Mondays. Hours: March 1- Oct 31: Tues-Sat, 9:30am-6:30pm Holidays & Sundays, 10:00 a.m.-3 p.m. Nov 1-Feb 28: Tues-Sat, 9:30am-6pm Holidays & Sundays, 10am-3pm Closed Mondays year round. Spend the day exploring the UNESCO World Heritage-listed Toledo with a local guide and tour top attractions like the local cathedral, Old Town and more. This popular trip is fully customizable and perfect for first-time visitors, history lovers and families. When visiting Madrid, take a fascinating detour south to experience the multicultural heritage and UNESCO-listed old town of Toledo. With this private tour, travel in comfort to reach the medieval heart of the city, and let a guide show you the Alcazar fortress, Gothic cathedral, Jewish quarter, and other top sights on an itinerary tailored to your interests. Back in the capital, walk in the footsteps of Spanish kings and queens with a guided visit to the opulent Royal Palace of Madrid — one of the largest in Europe.